They are the only children in an angry crowd. 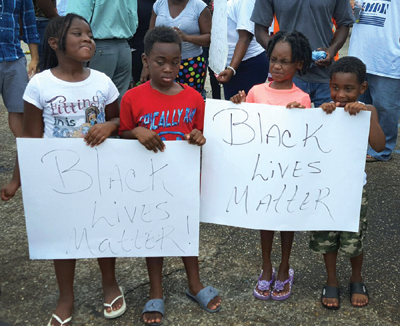 Standing quietly under a searing sun, the four youngsters, two boys and two girls, hold up hand-scribbled signs during the first day of protests in Baton Rouge over the city police killing July 5 of Alton Sterling. Wire service pictures of the unidentified four children will appear nationwide. Whatever your view of the Black Lives Matter slogan or the national movement to change American policing, these four kids are impressive representatives of their families, their peers and their respective communities. Amid near-deafening chants of “No justice! No peace!” they’re quiet, disciplined and respectful of their elders – the kind of children you might want seated at the next table of your favorite restaurant. “I brought the children to the demonstration because I wanted them to see for themselves what was going on – not just what I say is happening or what the police say is happening,” says Eshantra Coates, 28, the mother of James and Jakayla and the aunt of Desmond and Dashayla. At the moment, we – Ms. Coates, the four children, the protestors and the news media – are all standing in the parking lot of the Triple S Food Mart in impoverished, majority-black north Baton Rouge. This is the same lot where, 36 hours earlier, two white city police officers fatally shot Sterling, a 37-year-old black, formerly incarcerated father of five children and a neighborhood CD vendor, who authorities say had a gun in his pocket when he scuffled with police. Fearing the kind of riotous reaction that followed police killings in Ferguson and Baltimore, Governor Edwards quickly – and wisely – calls for a federal investigation of Sterling’s death, several hours before the first day of protests get underway outside the Triple S Food Mart. There is no visible police presence on this busy stretch of North Foster Drive. The demonstration is spirited but peaceful – even with temperatures in the high 90s. The four children hold up their signs for a battery of news cameras. Jakayla and her brother James remain stoic, clutching their sign. Towards dusk more teenagers appear. A few hop on the hoods of slow-moving cars. Other teens briefly block traffic; they’re obviously showing off. Kid stuff. Ms. Coates and the four kids leave after approximately three hours at the Triple S protest. They don’t return to attend any of the later more restive demonstrations near Baton Rouge police headquarters and elsewhere in the capitol city. • Black males in the U.S. today are 2.5 times more likely to be shot and killed by police than white males, according to an ongoing study by The Washington Post. • The per capita homicide rate for black males in Louisiana was 27.75 residents per 100,000 black residents in 2012 – far exceeding the national average of 18 homicides per 100,000 black residents the same year, according to the Violence Policy Center at Washington, D.C.
“What is the ideal world in which we want to raise our children to become healthy, responsible and considerate adults? We all agree that we want less crime – that’s not the point. Where we disagree is on policy – what is the long-term solution? Most dialogues between whites and blacks are based on bringing together the elites of both races. Such dialogues have no effect on the rest of the population. Perhaps Baton Rouge can start with Ms. Coates and her kids.